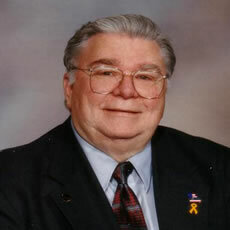 Louis E. ‘Lou’ Schaefer, former Mayor of Branson, passed away early Tuesday morning, September 9 at the age of 80. He served as mayor from 1995 to 2007 in an unprecedented six consecutive terms. A champion of strong economic development, Mayor Schaefer led Branson through periods of robust, unparalleled growth. From 2004 through 2007 alone, more than $580 million worth of new construction was undertaken with the creation of the Branson Convention Center and hotel complex, Branson Landing and the adjacent waterfront expansion, and the development of Branson Hills in the northern sector of the city. During his tenure, Branson reportedly expanded its city limits from eight square miles to its present 20 square miles. In 1996 Mayor Schaefer, long noted for focusing on critical environmental issues, organized a regional conference on water quality which became the precursor to the highly-touted James River Basin Partnership. Under his direction, Branson became the first city in Missouri to install phosphorus removal/retrieval equipment on its wastewater treatment plants. Additionally, Mayor Schaefer took advantage of annexation to remove hazardous septic systems which threatened the area’s watershed. A proud member of the United States Marine Corps, Mayor Schaefer was a prominent supporter of Branson’s daily commitment to our nation’s military. During the Veterans Homecoming, the nationally recognized annual event honoring and welcoming Veterans to Branson, it was not unusual for him to make personal appearances at dozens of the events held during the seven day events each November 5–11. Mayor Schaefer moved form his native of St. Louis to Branson in the early 1950’s and was successful in several facets of business. Before his election as Mayor, he served on the Branson Board of Aldermen as mayor pro-tem. He was past president of the Branson/Lakes Area Chamber of Commerce and Convention and Visitors Bureau and sat on the boards of Silver Dollar City, College of the Ozarks and the former Security Bank. His accomplishments as mayor earned Schaefer the prestigious 2008 Missourian Award which he will posthumously receive on September 27 in Jefferson City. Above all, Mayor Lou Schaefer will be remembered with great fondness as a tireless supporter and representative of Branson’s citizens and its family-friendly face to the world. Visitation will be this Friday, September 12th from 6-8 p.m. at Faith Lutheran Church, 221 Malone Street, Branson. Funeral services will be held on Saturday, September 13th at 10 a.m. at Faith Lutheran with interment taking place at Snapps Bearden Cemetery on East Highway 76, Branson. 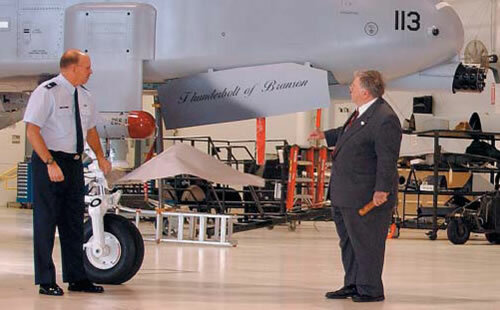 In recognition of Branson’s ongoing support of the US Military, Col. Mark Ronco, 442nd Fighter Wing Vice Commander and Branson Mayor Lou Schaefer unveil the A-10 ‘Thunderbolt of Branson’ at a ceremony at Whiteman Air force Base, MO. in February 2006. Photo used by permission from the US Air Force. © MSgt. Bill Hintington.